Game Information: The Dark Knight is one of the most played and popular progressive jackpot games in the Microgaming pockies library. The game features imagery and scenes from the blockbuster movie along with great gameplay, a fantastic soundtrack and awesome game winning features. The Dark Knight was a phenomenally successful movie and part of the updated Batman franchise. When fans of the movie heard that Microgaming were going to be releasing a faithful rendering in the form of a mega progressive jackpot pokie, the internet casino gaming word went crazy with anticipation! Check out our review of this mega-successful themed slot and try it out for yourself afterwards! In the game, the Batman symbol represents the games wild symbol and can be sued to substitute any other playing symbol other than the scatter symbol, to make winning combinations lightning-quick. The games scatter symbol is the Joker Painting which can be used to trigger the games free spins in a bonus round. The Free Spins Bonus round offers players the opportunity to spin the reels for free and includes a 2x multiplier which grows as more free spins are added. 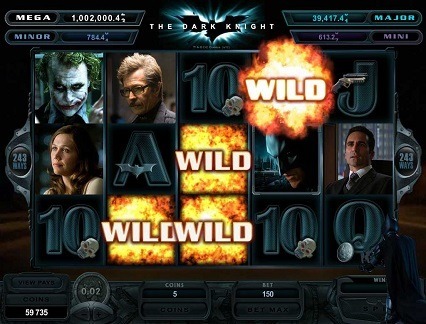 The Dark Knight also offers players a chance at a randomly triggered jackpot round where players can choose between Batman and the Joker which will ultimately determine the nature of the prize they may receive. 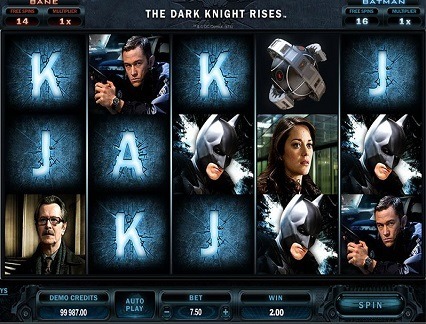 The Dark Knight slot has a lot to live up to, especially when it comes to diehard fans of the movie. Fortunately Microgaming do not disappoint and the game is filled with the lethal danger and chaos brought on by the Joker. The game graphics are superb and the icons and characters have been reproduced faithfully throughout the game. 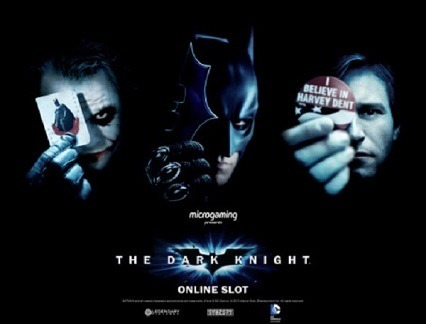 The game is also cut together with a variety of real clips from the movie which adds much more to the realism and the excitement of playing the Dark Knight. The batman himself makes regular appearances, as does his arch-nemesis the Joker, accompanied by a soundtrack taken from the movie. The Dark Knights progressive jackpot is nothing short of awesome and offers four different progressive jackpots, making the chances of hitting one of them even better. The four different progressive jackpots consist of a mini jackpot, a minor jackpot, a major jackpot and a mega jackpot. Each of the four progressive jackpots are triggered randomly at any time during the game and each one is also linked to Microgaming’s vast progressive jackpot network. This means that even the mini jackpot could potentially pay out a huge payday! The unique angle with the four progressive jackpots is that players are taken to a separate screen and instead of playing more lines or reels, players simply choose a side. Players can choose to go with Batman or choose to go with the Joker. A simple single wheel is presented in the idle of the screen and players get to spin it, the wheel is segmented with the four different jackpot possibilities and players could land on a mini segment or he mega segment. Dark Knight Logo Wild: This symbol substitutes for other game symbols to create fast winning combinations and can also be stacked for even bigger pay out opportunities. Batman/Joker Logo Scatter: This unique combination of the Batman and the Joker logos is the games scatter and getting three anywhere or even just two in the same row, will trigger a round of free spins. Free Spins: Up to 15 free spins can be awarded at a time and they include a minimum 2x multiplier which can also grow as free spins progress.